If there’s one thing that London isn’t short of, it’s Cantonese restaurants. For years it was the only kind of Chinese food widely available in the capital, with other cuisines from the continent-sized country only becoming prevalent in the past decade or so. This increased regional representation makes Duck Duck Goose even more of an oddity. 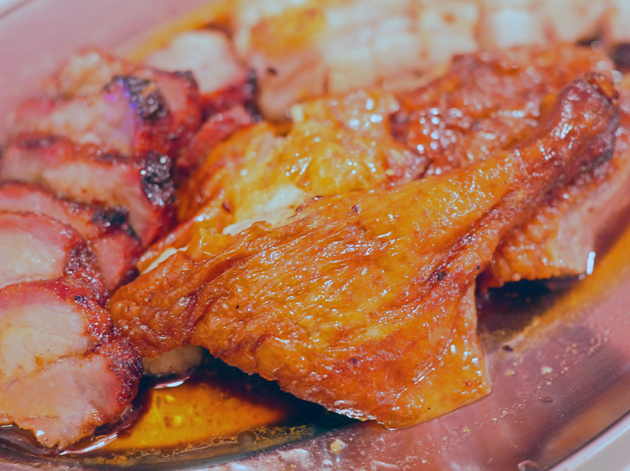 This Brixton restaurant focuses on Cantonese roasted meats, a staple already well covered by multiple Chinatown restaurants. Duck Duck Goose is located in Brixton though, a part of town hardly known for Chinese cuisine (with perhaps one exception). This, along with the approachability of roasted meat, the difficulties in recruiting and keeping trained chefs and the limitations imposed by Duck Duck Goose’s tiny kitchen, almost certainly explain the proprietor’s decision to stick with roast poultry and pork. If nothing else, Duck Duck Goose is a far more welcoming place than most Chinatown restaurants. The bright and cosy décor feels more like an Ikea showpiece, while staff were friendly and patient – if not quite as efficient as their more brusque Chinatown counterparts. Although less than half the size of an average Tube carriage due to its location inside a repurposed Pop Brixton shipping container, there are still 20 covers – some tables even have power sockets and USB ports for recharging your phone. The window sill lined with mahjong tiles is just out of frame. Duck Duck Goose bears a very faint resemblance to Holborn’s Cha Chaan Teng in having a handful of Hong Kong and postmodernist dishes on its short menu. 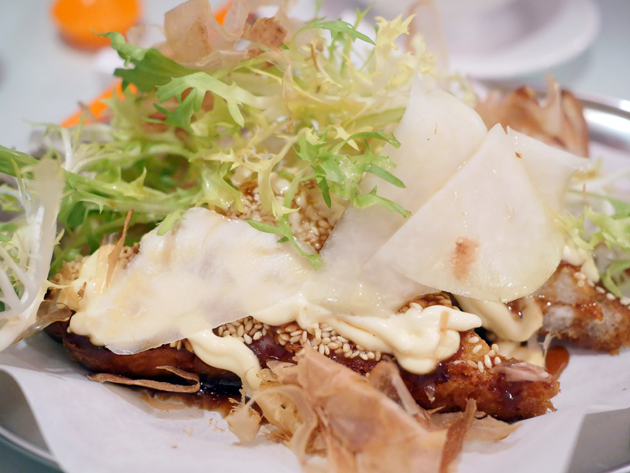 The prawn toast here inexplicably comes with a heap of okonomiyaki-style toppings – quivering bonito flakes, kewpie mayo, radish slices and brown sauce as well as a large heap of endive sprigs. None of that could disguise the fact that the toast wasn’t quite crisp or crunchy enough, while the minced prawn loaf layer was oddly light and inconsequential. It wasn’t bad, but it was far from memorable and not a patch on Cha Chaan Teng’s admittedly more expensive and luxurious version. I keep typing ‘Duck Duck Go’, but that’s the name of a search engine. Eating here was, if nothing else, a reminder that most people still don’t know what bonito flakes are. 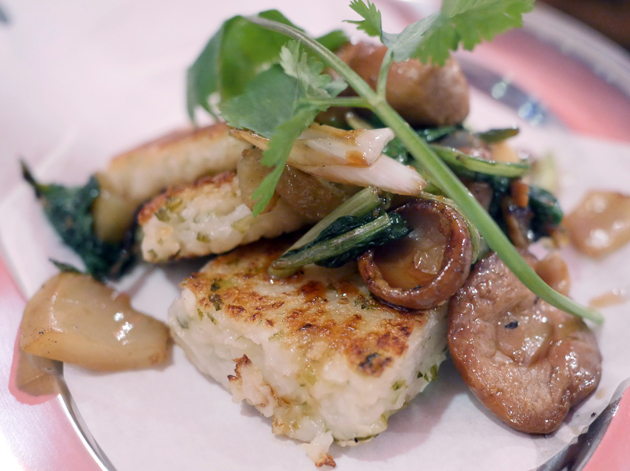 The turnip cake (or turnip loaf if you prefer) was almost certainly made from scratch rather than merely retrieved from a catering pack as it had a loose, large grained texture to it, rather than a consistent smoothness. The muted caramelisation and lack of the distinctive sweet starchiness common to most versions of turnip cake was disappointing and explained the generous amount of chilli dipping sauce on the side. Ceps were taut and slippery, but their uncharacteristic blandness meant they brought little to an already underwhelming starter. ‘Turnip’ + ‘cake’ in the name of a single dish = recipe for perturbing total Chinese cuisine novices. Roast duck is available in quarter, half and whole bird portions and is also a part of the three-meat selection platter. While lightly earthy and moist, there wasn’t enough extant fat while the skin wasn’t especially supple and lacked both umami and sweetness. It’s far from bad, but the choice of bird and the quality of cooking isn’t quite good enough to justify prices almost double those of Chinatown’s Four Seasons for an equivalent portion. If you think this looks excessively red and orange, you should’ve seen these photos *before* I colour-corrected them in Photoshop. Pork was more sure-footed. 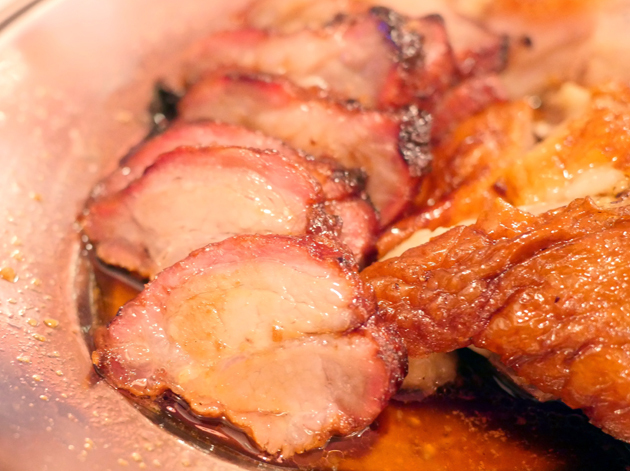 Slices of char siu were moist, lightly sweet, smoky and umami with none of the artificially luminous colouring often seen in Chinatown. 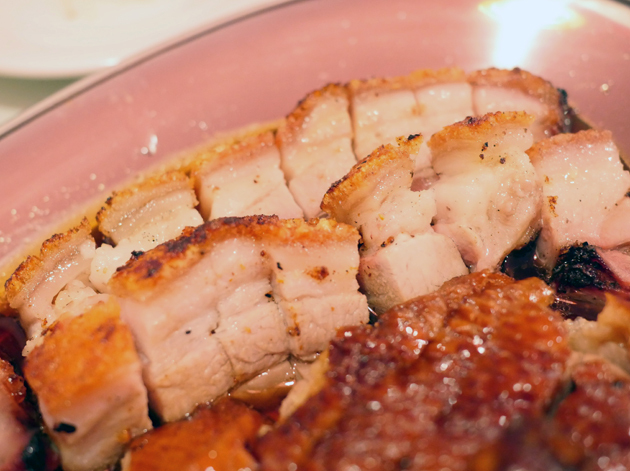 Hearty pork belly wasn’t quite milky enough, but it was still enjoyable with its moistness and crunchy golden crust of a skin. 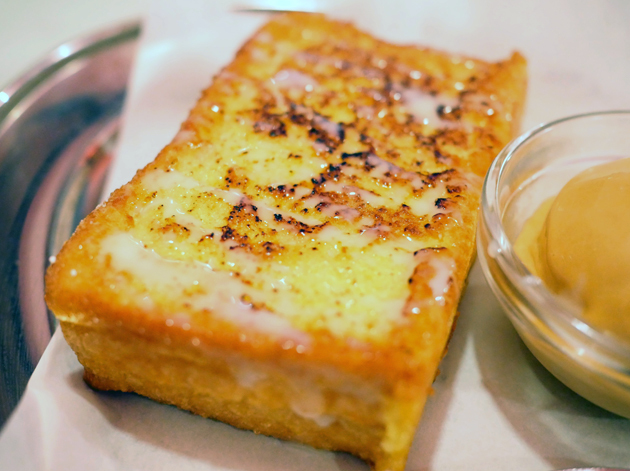 Hong Kong-style peanut butter French toast was an oddly restrained and underwhelming dessert, especially when compared to its outrageously over-the-top counterpart at Cha Chaan Teng. The toast wasn’t caramelised enough, while the modest amount of peanut butter wasn’t especially viscous or powerfully flavoured. The accompanying ice cream, surprisingly, was far better. Apparently soy and caramel flavoured, the resulting salted caramel effect was exemplary with its balance of sweetness, saltiness and tanginess. 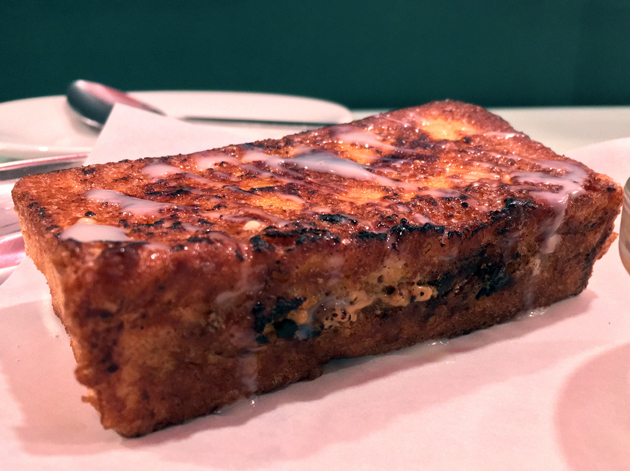 It not only made up for the French toast’s meekness, it was also far better than many other ice creams which explicitly claim to be salted caramel flavoured. 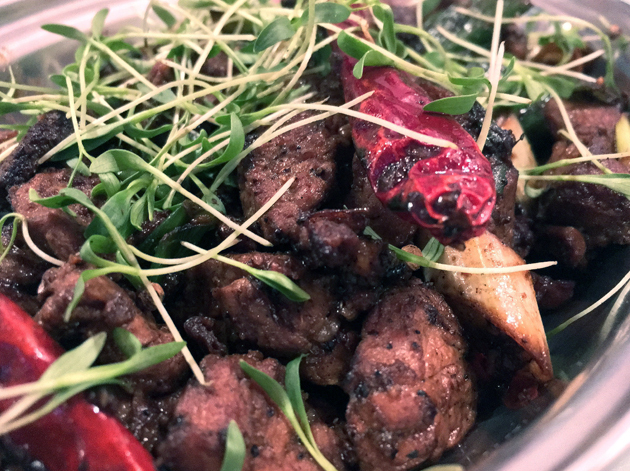 Although the mild spicy heat of the cumin chilli lamb won’t impress any chilli aficionados, this did at least allow the distinctive herby astringency of the cumin to shine through. This won’t suit everyone, especially as it overshadowed any character the lamb may once have had, but the meat was at least tender. The initial gamey funk of the roast goose passed quickly, so this bird ended up resembling the duck quite closely. 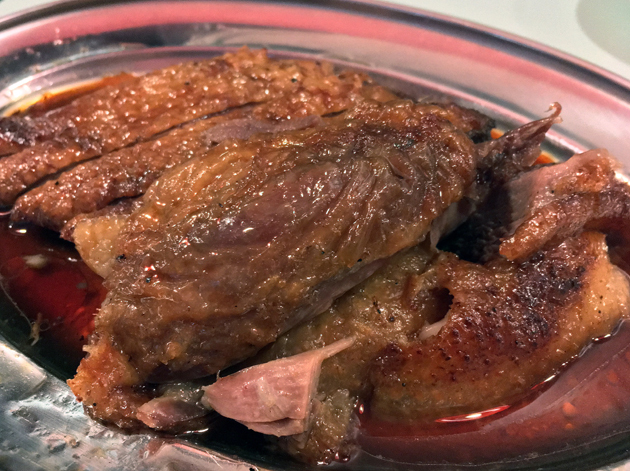 While still quite lean, the goose slices had a little more fat than the duck – both rendered and extant – providing a somewhat richer mouth feel. The skin was moderately more taut and slippery too, with a more pronounced but still somewhat sedate sense of sweetness and umami. This goose needed a little more goosing. 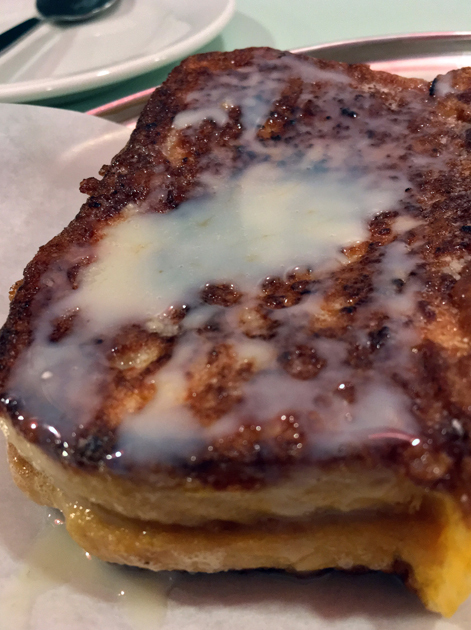 The peanut butter French toast was much the same as it was before. Minor differences included a little more caramelisation in the toast and a modestly more generous helping of peanut butter. Although this provided a tad more viscous nuttiness, this dessert still wasn’t as visceral as Cha Chaan Teng’s version. Hong Kongers shouldn’t be surprised by the uptick in popularity of this dessert in the West – it’s easy to make at scale, odd-yet-familiar, accessible and non-threatening. Duck Duck Goose is, quite obviously, aimed primarily at red meat carnivores. 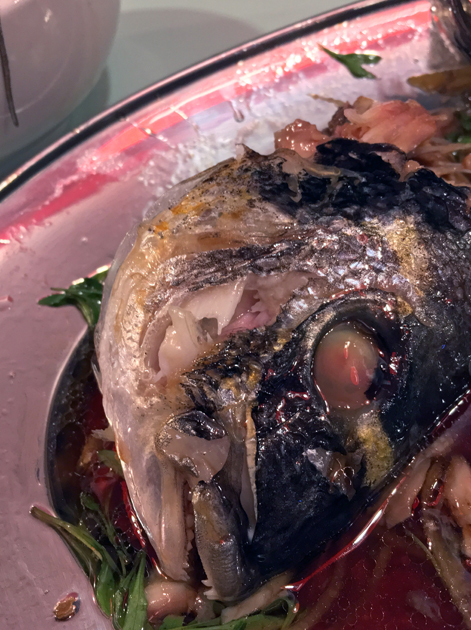 Pescatarians can eat well though – steamed fish is a Cantonese classic, with your choice of whole bream or bass. 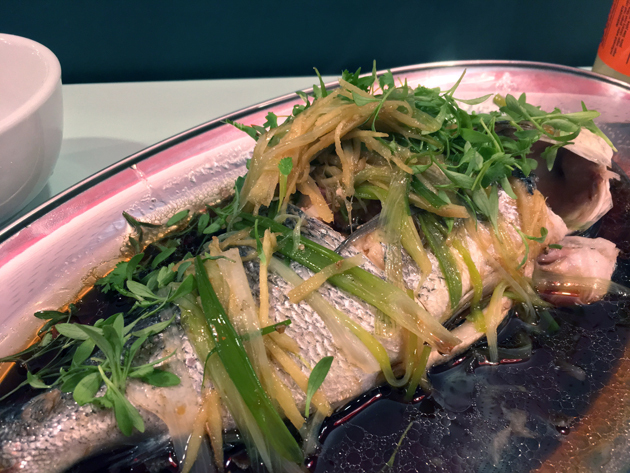 Flaky pearlescent bits of bream came easily off the bone, garnished with sprightly ginger and coriander, while the light, sweet and umami soy sauce was good enough to drink. The dorsal finlets should’ve been trimmed off for a tidier eat, but it shouldn’t pose too much of a problem if you’re adult enough to look a fish head in the eye while deboning its carcass. Some of the ginger etc pushed to the side for your viewing pleasure. 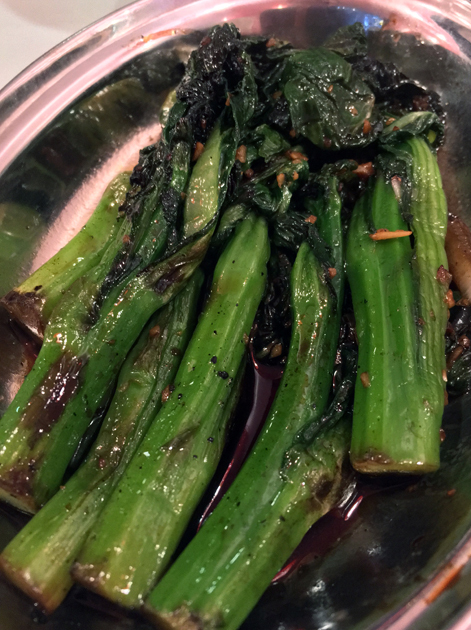 Leafy choi sum was cooked just so in a lightly umami sauce. 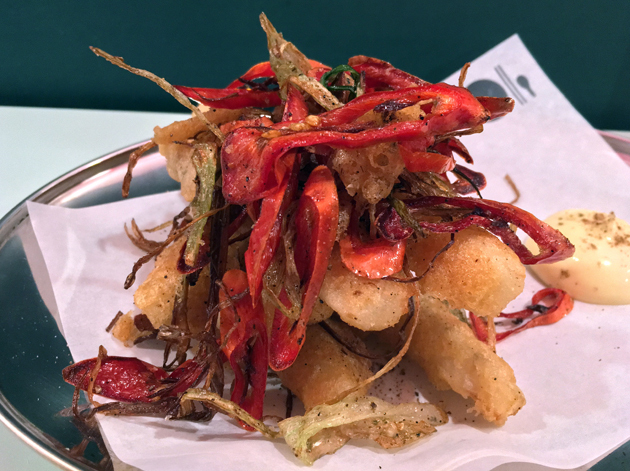 Battered salt and pepper salsify was undemanding and underwhelming, perhaps unsurprising given that it’s a variant of the take-away squid classic. 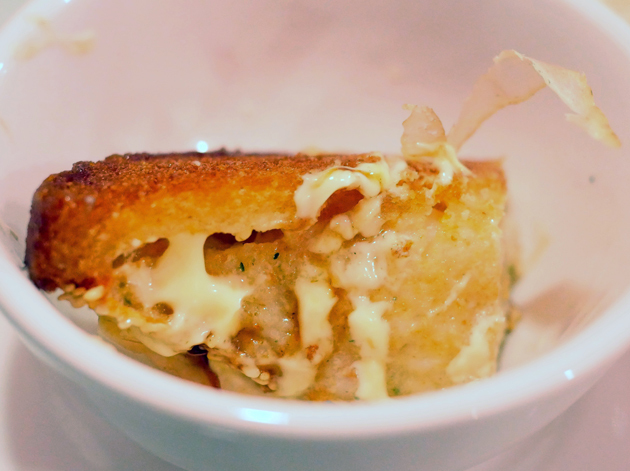 The deep-fried coating was light and oil-free, but the soft tube of salsify inside required a lot of imagination to discern its very mild sweetness. The garnish of tame chilli and spring onion was more interesting. The salsify may, perhaps, come into its own when taken with the richer, more strident roast duck or goose instead of the steamed bream, but I wouldn’t bet on it. There are a surprising number of other businesses out there also called Duck Duck Goose. Peanut butter French toast with soy and caramel ice cream remained unchanged. Not quite the toast of the town. The Euro Hedgie, my loud-mouthed dining companion who accompanied me on my first meal at Duck Duck Goose, constantly texted me during the writing of this review to remind me of the duck’s priciness compared to Chinatown’s Four Seasons. While true, that centrally located stalwart benefits from greater economies of scale and almost certainly thinner margins which helps keep its roast duck prices lower. The taste and texture of the duck here really should be of a higher standard to justify its higher pricing, but Duck Duck Goose is still far from a total loss. The duck and goose were only respectable, rather than remarkable, but the pork dishes were fine testaments to the porcine arts. Plus, your money does get you slicker décor, a more comfortable, welcoming atmosphere and a generally friendlier level of service compared to the Chinatown standard. The appeal of such qualities shouldn’t be underestimated – they’re good enough to keep afloat restaurants that are otherwise moderately or critically flawed in the culinary arts. 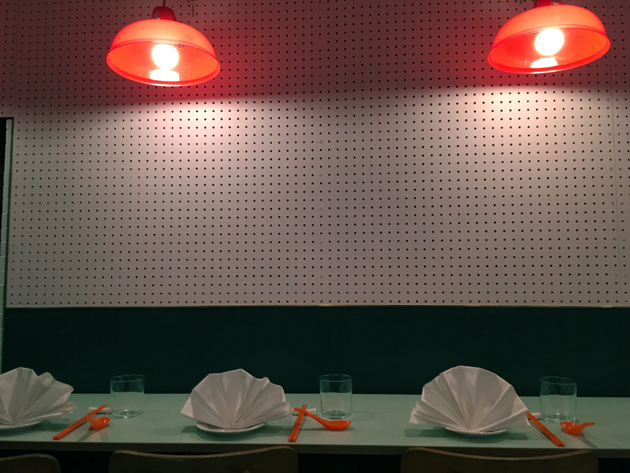 Duck Duck Go’s primary appeal will be to Brixton locals eager for a closer-to-home Chinatown alternative. Even so, I still wish a restaurant serving lesser-known Chinese dishes, ones that deserve just as much appreciation as Cantonese roasts, had the opportunity afforded by its real estate. Still, Duck Duck Go is good enough – fortunes and restaurant chain empires have been built on less. Opening Hours: Tuesday-Thursday noon-15.30 and 18.30-22.30; Friday-Saturday noon-16.00 and 18.30-23.00. Closed Monday. Average cost including soft drinks when shared between two but excluding tip: £30 approx. Tags: brixton, cumin, duck, duck duck goose, french toast, goose, lamb, london, peanut butter, pork, pork belly, prawns, restaurant, review, roast duck, turnip. Bookmark the permalink.